Lauren Long, the head of the public library in the charming little town of Silvermine, Colorado, is determined to focus on her job while her boyfriend Justin is out of town. When her neighbor Mike is found dead on his kitchen floor, Lauren can’t help but think that it’s murder. There’s the matter of the pink dog leash, for one thing. She tells the police that she will stay out of the investigation, but her curiosity makes that impossible. 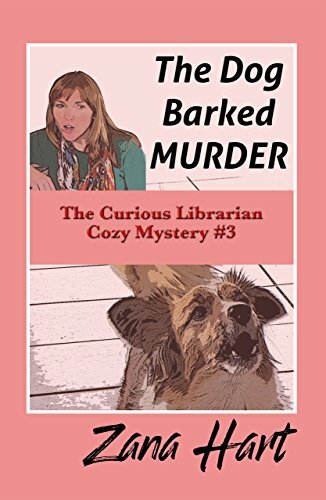 Complicating matters, Lauren’s little dog Mickey has his opinions about who the good and bad people are, and he expresses them by barking, hiding under the bed, and trembling. There are ominous sounds in the night a time or two at Lauren’s house. Her boyfriend Justin pleads with her by phone to borrow his brother’s Rottweiler. Lauren is unconvinced that she is at risk, as all she is doing is thinking. But she gets a stern warning from the hero of a famous series of mystery novels that a dead librarian is completely useless. Still, she comes all too close to jeopardizing the dreams that she and Justin have for their future. What happens changes her forever. Click on the book cover image to see the book on Amazon.com. If you have Kindle Unlimited, you can read the book that way.